The Bonanza Inn & Suites Hotel is your place to stay in Yuba City, CA. Our Hotel caters to the needs of business travelers as well as families on vacation. Located a block away from Highway 20 and Highway 99, The Bonanza Inn & Suites is a full-service hotel with meeting and banquet spaces boasting over 6700 square feet of flexible meeting rooms. The Bonanza Inn & Suites provides the complete hotel experience with friendly staff and helpful guest services, designated pet-friendly rooms and clean and comfortable accommodations. The Bonanza Inn & Suites has a total of 116 guest rooms including 2 suites with a fireplace and 6 suites with an oversized jet tub and fireplace. 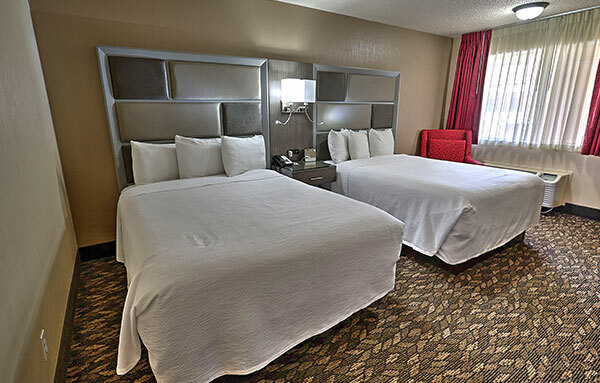 In addition to our suites, the Bonanza Inn & Suites offers guests double queen guest rooms as well as bed rooms with plush king beds perfect for couples or business travelers. All of our guestrooms are ADA Defined service-animal friendly, and all of our well appointed newly remodelled rooms come equipped with a variety of amenities including complimentary high-speed wireless internet access, flat screen TV with cable, coffee maker, free local calls, refrigerator, microwave, hairdryer, iron & ironing board, alarm clock, and ADA accessible rooms are available upon request. Our suites also include sitting area with dining table, fireplace, and large bathrooms. Guests at the Bonanza Inn & Suites in Yuba City enjoy amenities like our outdoor pool & spa, meeting & banquet facility, high speed WiFi, full service convention center with catering services available, 24 hour front desk, dry cleaning & guest laundry service, fax services, ice & vending machines, free outdoor parking, ATM machine, close working facility, full hot breakfast, and elevator. Our freshly cooked breakfast daily by Chef Kevin and Chef Brian includes a variety of choices for all palettes. Enjoy scrambled eggs, pastries, muffins, donuts, sausage, bacon, biscuits, country potatoes, country gravy, fruit, juice, and coffee. We’ll make sure your day gets off to the right start when you stay with us at the Bonanza Inn & Suites. We are a pet-friendly hotel where small dogs are also allowed. Now that you have found the best Yuba City Hotel to stay, you will need to fill your schedule with popular attractions and things to do in Yuba City. The Bonanza Inn & Suites Hotel has a variety of exciting attractions nearby. Whether you're looking for the buzz of a city or the relaxing calm of a secluded lake, Yuba City, California has them all, and at The Bonanza Inn & Suites, you'll only be a short distance away. Some nearby Yuba City attractions include Camp Far West, Collins Lake, Sleep Train Amphitheatre, and Gray Lodge Wildlife Area. Additionally, depending on the time of year, you can enjoy one of the many festivals including Bok Kai Festival, Marysville Stampede, Yuba Sutter Fair, and Sikh Parade. Let Bonanza Inn Yuba City host your corporate meetings, holiday parties or business forums. The Bonanza Inn has a collection of banquet and conference rooms making it a perfect venue for weddings, parties, or classes. We work with a variety of vendors and coordinators and are happy to assist you with your event planning.